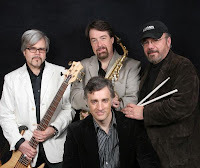 Tonight, Thursday, The Eric Mintel Quartet will be performing from 6 to 8 pm in the courtyard at Princeton Shopping Center, 301 North Harrison Street in Princeton Township. Eric Mintel, who has performed at the White House and at The Kennedy Center many times, is the leader of the professional touring jazz ensemble. The Eric Mintel Quartet features Eric Mintel on piano, Nelson Hill on alto sax, Dave Antonow on bass and Dave Mohn on drums. Jazz legend Dave Brubeck says, "As long as the music attracts dedicated young musicians like Eric Mintel, jazz will continue to thrive and progress as a voice of freedom." The Eric Mintel Quartet recently released their ninth CD. Click here and here for more information on the group and to hear some great jazz.